The Cleveland Orchestra in Performance: Bruckner Symphony No. 4 premiered April 2014. The complete performance of Anton Bruckner’s Symphony No. 4 in E-flat major played in Austria’s historic Saint Florian basilica. The Cleveland Orchestra in Performance: Bruckner Symphony No. 4 features The Cleveland Orchestra conducted by Music Director Franz Welser-Möst in an infrequently performed edition (1888/89, arranged by Benjamin Korstvedt). 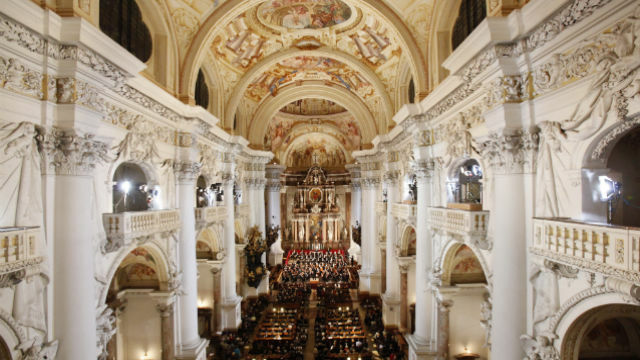 Presented by WVIZ/PBS ideastream in Cleveland, the program was recorded in 2012 at the beautiful 17th century baroque Abbey of St. Florian in Austria. The Abbey has a direct connection to the composer: he served there as a chorister and later as the Abbey’s organist. Although he later moved to Vienna, Bruckner chose to be buried in a crypt below the Abbey of St. Florian. Nicknamed by Bruckner himself, “Romantic,” the Fourth Symphony is one of Bruckner’s most popular and most-performed works. It marks a major milestone in Bruckner’s attempt to establish a symphonic design suitable to sustain his musical thought. The score’s first version was published in 1874 but was withdrawn by the composer before it was even performed. Bruckner made extensive revisions to the Fourth Symphony through the years, reworking it and rewriting. In 1881, the work premiered, but was revised again in the late 1880s. The 90-minute program also includes performances of two choral works by Anton Bruckner, Locust Iste and Ave Maria, performed by the Cleveland Orchestra Chorus, under the baton of Conductor Robert Porco and introduced by Music Director Franz Welser-Möst. According to Welser-Möst, Locus Iste is one of Bruckner’s most famous motets, written for four-voice chorus. It was written for the dedication of the chapel at the Linz cathedral. The text describes the beauty of the place of the Lord. Bruckner’s Ave Maria is filled with difficult harmonics and harmonic progressions, and is a basic declaration of love to the Virgin Mary, reflecting the faithfulness of the composer. 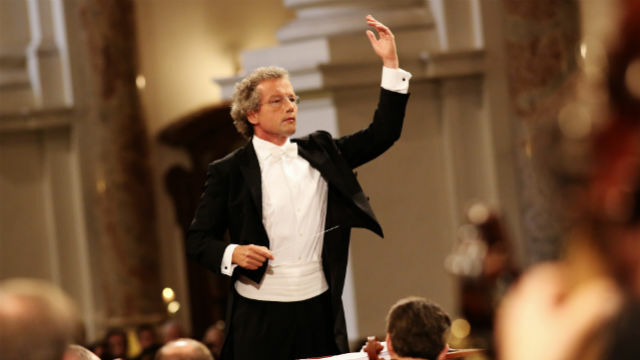 Internationally recognized for his presentation and interpretation of Bruckner’s symphonies, Cleveland Orchestra’s Music Director Franz Welser-Möst has conducted them with The Cleveland Orchestra at Severance Hall in Cleveland, the Musikverein in Vienna, Suntory Hall in Japan, Lincoln Center in New York, and the Abbey of St. Florian in Austria. Gustav Mahler composed portions of his Symphony No. 10 in the summer of 1910, while faced with his wife’s infidelity. The following year, he passed away from an infection of the heart at the age of 50. The composer’s intent was for the incomplete score to be burned, but his wife (who eventually married her lover, the famous architect Walter Gropius) managed to have the sketch orchestrated and posthumously premiered. Christian Gerhaher, baritone. Courtesy of Roger Mastroianni. The hauntingly beautiful Adagio from the Symphony No. 10 is featured in The Cleveland Orchestra in Performance: Boulez Conducts Mahler. The performance was recorded at Severance Hall in Cleveland in 2010, in celebration of Mahler’s 150th birthday and 100th anniversary of his death, and Mr. Boulez’s 45th year conducting The Cleveland Orchestra. Mahler’s highly emotional state while beginning to compose his last symphony (and which prompted him to consult with Sigmund Freud) is reflected in the Adagio with romantic intensity in the strings, accented by melancholy brass. The movement is often programmed alone, as it was the only portion of the symphony completed solely by Mahler. Balancing the Adagio on the program is Mahler’s Des Knaben Wunderhorn (“The Youth’s Magic Horn”), Songs for Voice and Orchestra, with vocal soloists Magdalena Kožená, mezzo-soprano, and Christian Gerhaher, baritone. These 12 songs were written in the 1890s with text based on a collection of German folk poetry edited by Achim von Arnim and Clemens Brentano, published in Heidelberg, Germany, between 1805 and 1808. The miniature romantic masterpieces served as sources of inspiration for Mahler’s later works, including the tenth symphony. The Cleveland Orchestra, which in addition to performing in Cleveland, Ohio, currently maintains residencies in Miami, Florida; Vienna, Austria; and Lucerne, Switzerland. The Orchestra has received eight Grammy Awards and 31 Grammy nominations. In addition to recordings released on commercial labels, The Cleveland Orchestra has itself produced five sets of archival recordings: the 75th Anniversary Compact Disc Edition, the George Szell Centennial Compact Disc Edition, the Christoph von Dohnányi Compact Disc Edition, George Szell – Live in Tokyo 1970 (Szell’s last recorded concert), and the Robert Shaw Legacy Compact Disc Edition. The program is produced by WVIZ/PBS ideastream with international production partners CLASART Classic, ARTE, Accentus Music and Deutsche Grammophon. Producer, Herbert Kloiber. Director, William Cosel. Executives in Charge of Production, Mark Smukler and Jerrold Wareham. The Cleveland Orchestra in Performance: Boulez Conducts Mahler represents an ongoing collaboration between The Cleveland Orchestra and WVIZ/PBS. Most recently, a series of television programs featuring Music Director Franz Welser-Möst and the Orchestra performing works by Bruckner were produced for broadcast on public television stations nationwide by WVIZ/PBS. and Bruckner Symphony No. 4were produced by WVIZ/PBS ideastream and Clasart. © Copyright 2015 WVIZ/PBS ideastream. All Rights Reserved. Photos courtesy of The Cleveland Orchestra.